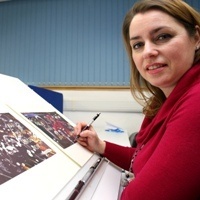 After leaving Art College in 1985 I built a career in the Printing Industry, involved with Graphic Design. I left work in 1998 to start a family. While the children were growing, I started producing wall murals for them and their friends, and went on to start my own mural painting business, I have produced work for individual clients, and businesses, the largest of which were 2 themed party rooms in a soft play area, and a school mural over 6 metres long! In 2009 it was time to start again, and so went back to school! Studying Illustration and Design at University of Sunderland has given depth and range to my work. Recently I have found acclaim with a book I put together in response to the London Riots of 2011. Pieces from this book have been in exhibition in New York. “People really responded well to the detailed work of your illustrations and found your motivations for making the work interesting after reading your statement- not a lot of NYer’s knew much about the riots in London. And using the Blurb website to publish the book, I was fortunate to have it awarded staff pick book of the week, with the following comments made in the book review. The whole review can be seen at Blurb.